Home Sheep Home is Freakin’ Sheep! 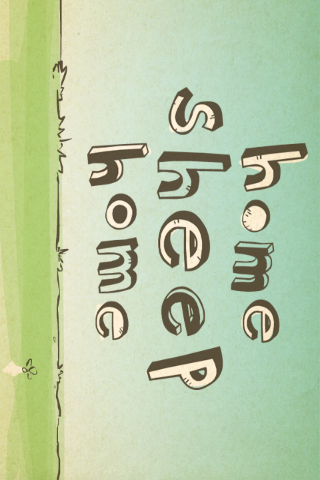 Home Sheep Home is the name of this animal based physics puzzler from Virtual Programming Ltd. Shaun the sheep and his friends Timmy and Shirley are looking to escape the farm. To do so they’ll need to navigate the treacherous barnyard terrain and work together to complete more than a dozen puzzles, but that’s it. This game was based on a flash game on the Internet and it made its translation to the iPhone due to its popularity. The bad thing about this game is that there are only 15 levels of game play which really knocks down the replay value. This is the only negative about the game but it is a major one. The game play itself is a rather fun mix with physics and problem solving. 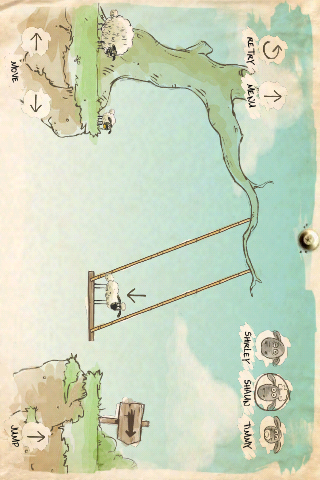 The physics portion is mostly based on the different weight of the sheep and how you move them around the puzzle. Each of the sheep is a different size. Shirley is the biggest, Timmy the smallest, and Shaun is in between. Size plays an important part in Home Sheep Home, as there will be certain areas of a puzzle only accessible by the smallest or certain objects that can only be moved around by the largest. For example, the heaviest sheep is best suited to push things around and be the muscle while the littlest sheep is used to get in high places on a trampoline or by standing on top of the other sheep. All of the puzzles rely heavily on physics; so again, you’re going to have to be thinking about the weight of each sheep before tasking them to do certain things. 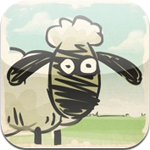 Home Sheep Home’s graphics are one of the distinct features within the game. The look of the game seems to be scribbled lines and washed out colors which make it seem like a watercolor painting. Even though the graphics are simple it makes the game better and gives it its own unique feel as a game. The sound in the game is rather bland but you do not really notice and it can be supplemented by your own music if you choose. All in all, this is a fun puzzle game and one that has enough things going for it to be different from other games out there, but the lack of levels really hurts this game. 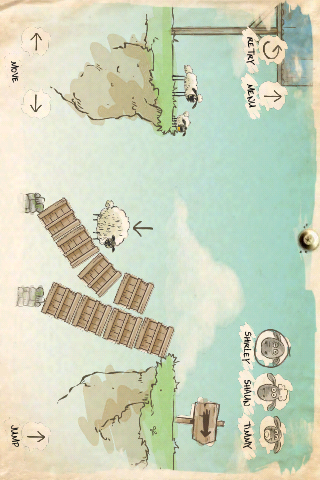 I think Home Sheep Home should be picked up for a dollar with anticipation of more levels to come. Fun teamwork physics based puzzles.